Ever wonder what’s really in your store-bought soap? Once you start making your own soap, you’ll never have to wonder again! All Natural Soap Making is a comprehensive guide to making all kinds of soap, whether you want to decorate your home or pamper yours or your family’s skin. Homemade soap is not only an easy project for any level craft lover, but it’s beautiful too! The pure luxury of soaps made with coconut milk, almond oil, aloe vera, fruits and herbs is one of life’s little pleasures. 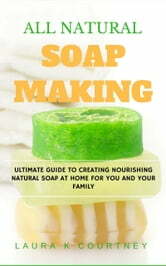 And with this book, it’s easy to make luscious, all-natural soaps right in your kitchen. This collection of 25 recipes ranges from simple castile bars to intricate swirl, embeds, and marbles and layered hooks. With All Natural Soap Making, you’ll be shocked when you discover how easy it is to bring out your natural beauty by simply using natural homemade nourishing soap. Many of the recipes in this book can be created in just a few minutes, so you might find yourself skipping ahead and doing more than one recipe in a day. This book can be a project for yourself, a gift for a friend, or an enhancement to your knowledge in the world of bath and body crafts. Whatever the purpose, the reader will enjoy!